Congratulations, you bought a new home! That’s a big step. Even more, you are taking a bigger step by upgrading the value of your new investment by installing new tile. That’s just plain smart! Using tile instead of other quick-wearing materials adds a higher level of quality and luxury to your home. The décor that tile displays is one that is timeless, having the versatility to complement any design choice throughout the ages as it has proven in Europe and Mediterranean regions. Tile is pricy. So it is wise to educate yourself about the product you are shopping for. Buying tile isn’t like purchasing the cheap alternative. The way that process typically goes is that you pick a color, get it installed, clean, and in a few years, you replace it, and repeat! That is not the case with tile. There are different stone options and designs. Although stone is a timeless décor, it is still good to know your options as one can become creative designing their home. When thinking of adorning your home with tile, do not limit yourself to just tile flooring. Consider how you might be able to incorporate tile as a backsplash, in your shower, as a countertop, and maybe even as a walkway. The possibilities are endless! First it is important to know what kind of tile is available to you. Natural Stone – A natural product of nature quarried from the earth that differs in color, texture, and composition. Mosaic Stone – Small squares of decorative stones connected within a 12 x 12 sheet for easy installation. Engineered Stone – A mixture of various stones, mainly made up of quartz, crushed into powder and mixed with dyes, and crafted to have the appearance of natural stone. Porcelain – A stone that is denser than others that can be glazed or unglazed. It reportedly has a water absorption rate of .05% and is more expensive. Depending on whether you want your tile indoors or outdoors or aiming to create a specific type of ambiance might influence your choice of tile. Understanding that lighter tiles, glazed or unglazed, will reflect light much better than darker color tiles. Therefore, for a room with few windows like a basement or bathroom might benefit from a Bianco Dolomiti or Champagne White Limra Limestone. On the other hand, a space that drinks in a heavy dose of sunlight can afford to get away with an Adalia Cappuccino or Rojo Alicante. Perhaps you are actually going for a dungeon-like feel. Then by all means, go for it! It is easy to fall in love with the most expensive type of tile. Just make sure that you can afford it. Yes, it’s great to spend money to possibly increase your property value. It is best to first figure out how much money you can afford to spend on tile. Next, decide how many rooms you’d like to decorate with it, and determine the square footage. Now you, have a footprint of what you want and can afford. Your salesmen can then be able to direct you to the tile within your price range. This way, you won’t find yourself shopping for something that you cannot afford. It is strongly recommended to buy your tile from a wholesale distributor. Home improvement stores can certainly provide a sufficient selection of tile options for you. At the same time, you can also expect to pay more than someone who buys it at wholesale prices. The purchaser usually buys in bulk to get a discount price. This can be done with wholesale distributors. It is generally based on the concept: ‘The more you buy, the cheaper the price.’ With wholesalers, the price can generally be negotiated. The drawback is that most wholesalers only sell to contractors, designers, engineers, and architects. Even if you don’ t hold any of these titles, you may know a person who does. Even though that particular builder or designer may mark up the wholesale price, it may not be as high as your local home improvement store. The bottom line is to find your tile a good price. This is important. 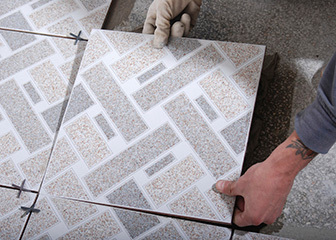 As much as tile can cost, it is best practice to order a sample whenever possible. First of all, the color presented in the catalog might be slightly different than the actual stone color. Also, the amount of light in the space that you are designing may give another shade of hue to the overall color. There is also texture to consider. One may like the color and pattern but find that they do not like the feel of the tile. Do yourself a favor and don’t place any big orders until you have a sample in your hand. The last thing you want is a full palate of the wrong type of tile. Contrary to popular belief, tile is not a set it and forget it type of thing. Yes, it is a lasting material, but it requires upkeep in order to keep it looking fresh and clean. Certain stones are more porous than others and require special cleaning in order to maintain its integrity. Others may not do so well in certain environments and may require a certain sealant to protect the surface. It is up to the buyer and homeowner to do their due diligence and learn about the proper upkeep of their new tile. Decorating your new home with tile is an excellent decision. Its durability has the potential to outlast the home itself. Now that you know what your options are, let Nalboor assist you with finding the right tile within your price range. Call us at at 305-501-4548. Our staff is available Monday – Friday from 9am – 5pm or contact us online.